What originally started off as a jiu jitsu training program for employees at Pear Street Grill and Brewery for people to get in shape and lean a martial art, has catapulted into an entirely self sustaining initiative in Downtown Buffalo. 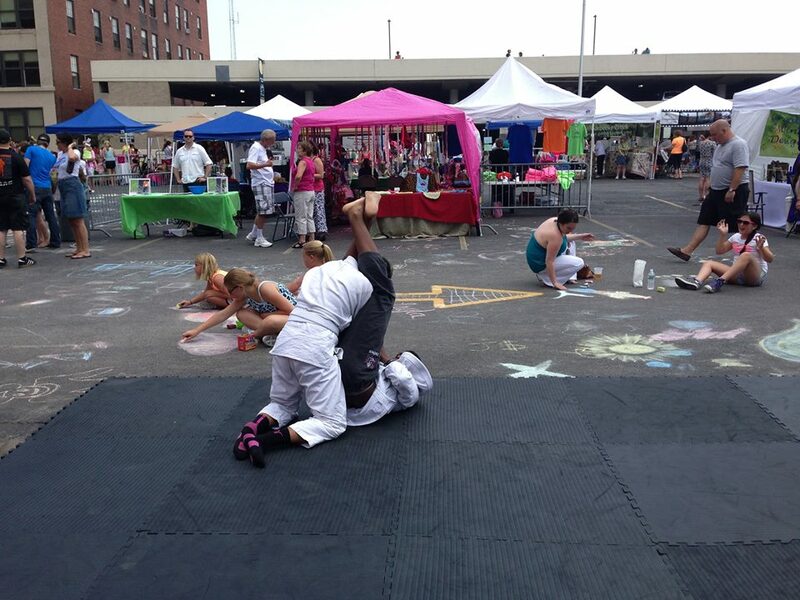 Buffalo United Martial Arts owner Josh Ketry has set up shop at 505 Main Street (formerly JP Fashions), with the intent to put Buffalo on the map for the explosive jiu jitsu scene. Just this weekend he opened the doors to his new training facility to show clients and interested parties the plans that he has for building a martial arts community on the 500 block of Main Street. Following is an interview with Josh regarding this exciting new addition to the city. How long did you run the brewery program at Pearl Street, and where? We ran the Pearl Street Brewery employee program in the Catering Rooms of the Webb building. It lasted 3 months and was very popular with about a dozen ladies and over 40 people signed up for it. Almost all of them plan on continuing their training at Buffalo United. Who else was it for? All of employees of Pearl Street, Lafayette Hotel, Pan American Grill and Webb Lofts on Pearl. With all of the other forms of martial arts, why Jiu Jitsu? I have practiced many different martial arts in my life, but Brazilian jiu jitsu (BJJ) is different. BJJ promotes the concept that a smaller, weaker person can successfully defend against a bigger, stronger assailant by using proper technique and leverage. Jiu Jitsu teaches you how to think logically and how to figure out ways to overcome bad situations. It is impossible to learn jiu jitsu and not make mistakes. Students learn how to use mistakes – both on the mats and in life – as ways to grow and improve. Above everything else, jiu jitsu teaches us how to be honest with ourselves. The most beautiful thing about the art is this honesty. It is impossible to lie to yourself or others about your skills, as it becomes apparent once you are on the mats. When you see a 120lb female choking out a resisting 200lb man, the reality is exposed. In a way it is almost like having a superpower. By finding this self-honesty, all practitioners are able to see genuine growth in their abilities and apply it in all areas of their life. Students quickly realize that their traits are not fixed – all people have the ability to grow exponentially and infinitely in all areas. If I could go back in time and give myself any one thing as a child, it no doubt would be jiu jitsu. I started in 1997 when I lived in North Carolina for a year (typical Buffalonian). My first day of class I went with a big muscular friend of mine and they made us spar with a small female who had been practicing for a long time. She tied us both in knots. On the drive home my friend’s ego was so bruised from being dominated by this girl that he was almost in tears and said he was never going back. I was shocked and felt the exact opposite. I was in love with the idea that a martial art did exactly what it was supposed to do – allow the weaker to defeat the [assumed] stronger. What is the scene like here in Buffalo? The scene in Buffalo is definitely on the rise. There are several core schools that have excellent competitors instructors from them. Several of the students have done well at the highest levels of competition in the world. Not all of the schools have historically gotten along, as some of them came about as fractures of each other. But without the different schools we would not be able to have a healthy competition scene here, and that is definitely something on the rise. I have trained with almost all of the school instructors here and have a respect for each of them. The more we decide to put the art in front of our own personal needs, the more we will see growth and receive back from it. How did you come across the Main Street space? The Main Street place sort of fell in our lap. Our employee program was outgrowing our space and the landlord – Nick Giammusso – needed tenants willing to put in a lot of work and take a risk in an area that is going through some changes (the whole block is under construction). We assembled the Pearl Street Habitat for Humanity crew and basically remodeled the entire building. Nick funded some things and we spent almost 2500 man hours gutting and molding it to our needs. What was the condition of the building like? It had a leaky roof, no electric or plumbing, all of the drywall, plaster and lath ceilings, and floors had to be removed. But the brick and wood beams told a story of industry that was quietly hidden and now once again exposed. 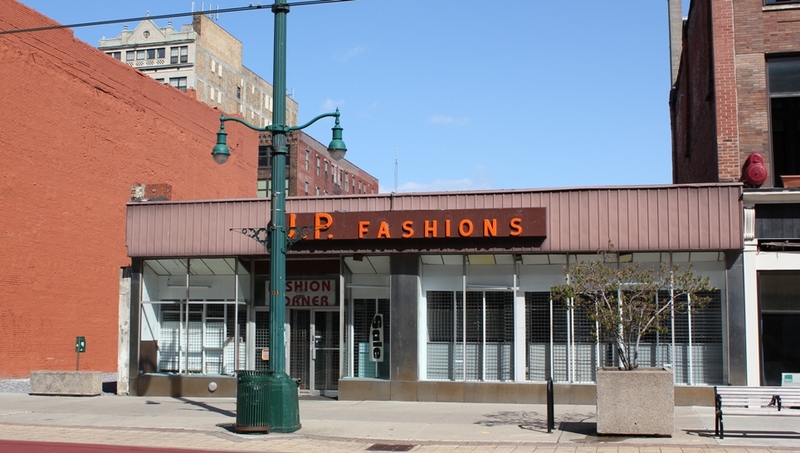 We love the look and we love being part of the downtown scene! What have you done to make it a suitable practice space? We sealed all of the brick and wood to prevent dust, added changing areas and restrooms for men and women, installed brand new mats and cleaned the heck out of it. Nick installed a new roof, all new electric, heating and cooling and plumbing. Who are you clients now? 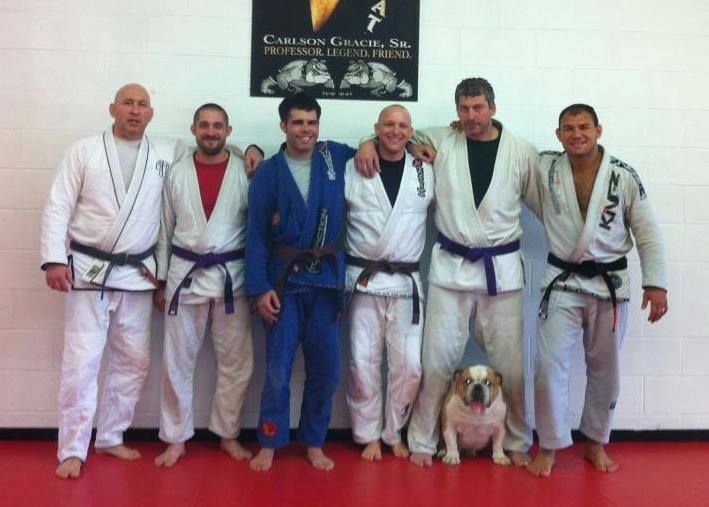 Anyone and everyone (jiu jitsu is for everyone!). I like to think we specialize in beginners, especially those who don’t think they can be good at it. We love helping people find new limits. 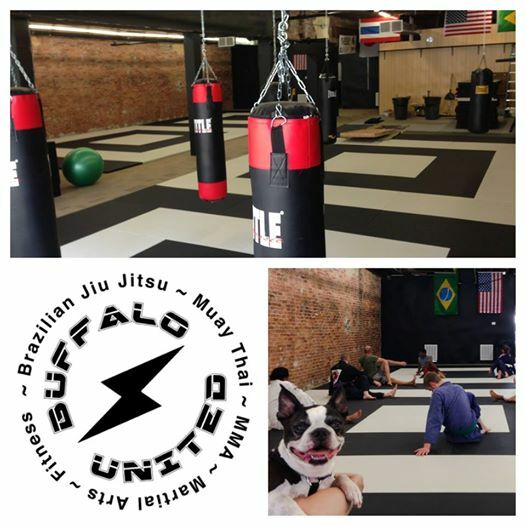 We are an affiliate of Buffalo BJJ (located in the Southtowns) and we were teaching in several of the Buffalo public schools downtown for free (Buffalo Science charter School, King Center Charter School). We wanted to be closer to these students for additional training and to other Buffalo students for the after school programs. For the adults we loved the idea of being close to those in the Elmwood/downtown area who may not be able to commute to the other existing schools, and the business folks downtown right after work. 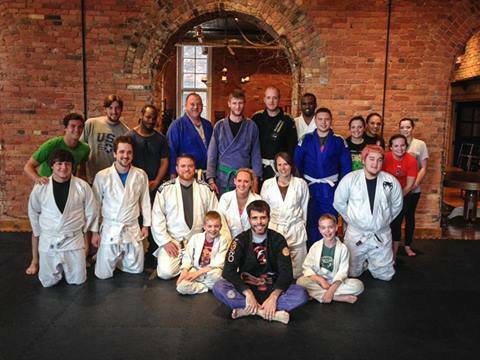 What is the future of Jiu Jitsu in Buffalo? The future is whatever we can work together to make. I believe the world would be a better place if everyone knew BJJ. It empowers people. It has improved every area of my life – from my relationships to the way I approach problems, failures, business and love. I would just finish by saying that entering a martial arts school can be an intimidating experience. Making the process a friendly, easy, and inviting one for everyone will do a lot to serve the art, and I am happy that is how most schools are approaching it now (it wasn’t always this way). Every person should set goals and reach them… and there are no limits to how much we can improve.